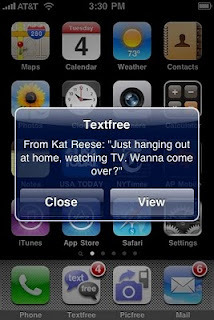 TextFree by Pinger is one of many free (not free before, was $5.99) texting application that you can find on the app store that will let you send and receive text messages for free. What's unique with this application is that it gives the user a real phone number (to date, pinger has already given more than 1 million numbers). Messages are sent as text messages through the internet and Pinger's server unlike other application whose messages are sent as some form of email or short code. Only downside of this is that the iPod or iPhone must be connected to internet and there will be a banner of ads displayed on the bottom part of the screen, which according to the users , are hardly noticeable. For now, the coverage are US numbers so this will come in handy only to those who have contact in the US of A. If only I own an iPod or iPhone perhaps, I would gladly test this application for everyone. If you want to try head on to itunes or search for the textfree on apps store. FREE texting number, even on an iPod touch! 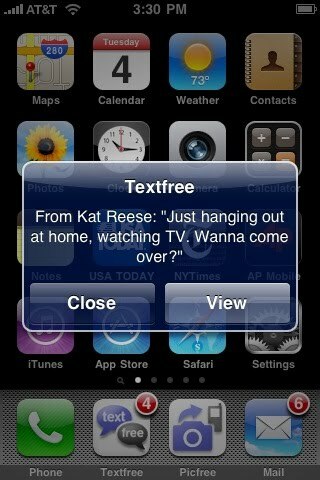 Yep, send and receive unlimited FREE texts from an iPod touch or iPhone to any US mobile phone. No catch, no hidden anything, no yearly fees! WHAT MAKES TEXTFREE SO SPECIAL? - Only texting app that gives you a phone number. - Only texting app where texts DON’T come from a weird number or email address. - Only texting app that supports ALL US carriers. - Highest-rated, fastest and most reliable text app. - Later this summer, you’ll be able to make and receive phone calls with Textfree, too!